On November 5th I attended a DPWE mini workshop in Castricum at the visitors center of PWN. DPWE is a joint research program of the four dune water companies: Dunea, PWN, Waternet and Evides. The workshop provided an update on research conducted at KWR and in partnership with Het Waterlaboratorium (HWL) on water quality and sources. This was my first DPWE workshop and the presentations gave me a much better understanding of the unique challenges and opportunities that the dune water companies face. The presentations underscored how the drinking water companies are not only responsible for providing safe drinking water – but also environmental stewards of the dune areas. A highlight for me was walking back to the train station through the dunes and seeing in person how drinking water and nature are balanced. If you have a free weekend I would highly recommend a visit! Prof. Dr. Pieter Stuyfzand of KWR discussed the chloride mass balance (CMB) method for estimating evaporation and groundwater replenishment as it relates to climate-change. The method is relatively simple and cost-effective but has not been used extensively in the Netherlands. The CMB method is especially well suited for use on inland and continental areas. 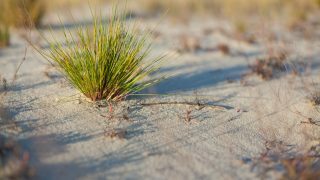 In coastal dune areas, however, the method can be more difficult to apply due to large spatial and temporal variation in chloride deposition, differences in vegetation type and uncertainties in chloride interception factors. Nevertheless, the method can still be applied if certain conditions are met and the uncertainties reduced, for example, by averaging measurements over long periods of time. Recommendations going forward included installing small lysimeters, exploring the use of other methods, such as the chloride peak matching method and using transport models such as Hydrus. Dr. Luc Hornstra of KWR and Lucas Borst of PWN presented their work on recontamination of dune and survival of bacterial through transport in unsaturated soil. The question of concern was whether short circuit pathways exist in the dunes that could affect the transport of pathogens. Their research looked at heterogeneities in the soil through the use of E. Coli and E. Moraviensis and tracers (brilliant blue). This research found higher than expected infiltration due to heterogeneities in the soil while the bulk of the pathogens remain in the unsaturated zone. Dr. Annemieke Kolkman of KWR presented about non-target screening for very polar compounds in drinking water. Liquid chromatography (LC) was used to separate polar compounds in drinking water. From the high resolution and mass accuracy of LC the elemental composition was determined, and the components fragmented to determine their structure. The research involved the analysis of water from DPWE locations and the identification and risk assessment of the polar substances found. Toxicological analysis found that most highly polar substances in drinking water do not occur at concentrations that pose a risk to human health. Dr. Aleksandra Knezev of HWL presented about the identification of Aeromonas species in drinking water through the use of MALDI-TOF-MS. The goal of the research was to use MALDI-TOF to detect the source and growth of Aeromonas in drinking water production and distribution. The research found that MALDI-TOF-MS can be used for the fast identification of Aeromonas, but the database does need to be supplemented with additional strains to increase the reliability.